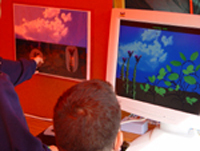 The Equator project was a six-year interdisciplinary research collaboration that ran from 2000-2006, between eight British universities, exploring the relationship between the physical and the digital for a range of user experiences, including playing and learning. A number of projects were conducted that explored how novel learning and playing experiences could be designed to promote reflection, collaboration and a sense of wonderment among children. An example is the Ambient Wood project which was an outdoors digitally-augmented learning experience. A variety of handmade and off-the-shelf devices (e.g., PDAs) were designed, built and deployed using a wireless network in a real woodland. 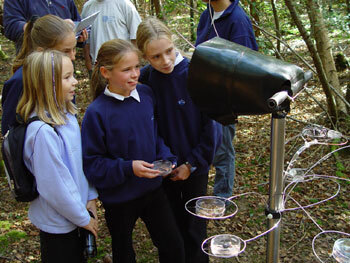 A main goal was to enable children to reflect upon various invisible biological processes (e.g., photosynthesis) through discovering various physical aspects of the environment (e.g., light, plants, insects). The range of learning tools included probing devices, an ambient horn and a periscope device that when interacted with provided a range of contextually relevant information. 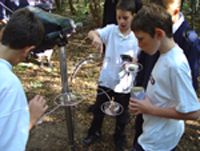 Our studies showed children explored the Ambient Wood in highly collaborative, imaginative and reflective ways.